If in fact the secret is truly in their eyes, as is announced like some new revelation in the title of this 2010 Oscar winner for Foreign Language Film, THE SECRET IN THEIR EYES (EL SECRETO DE SUS OJOS), then it must never have been much of a secret to begin with. As far as I knew, the eyes have always been the gateway to everything you want to know about another person but when it comes to this picture, you can almost get everything you need right there on the surface without any need to go deeper whatsoever. Argentinean director, Juan Jose Campanella, has been working in the American television industry for years, from series as varied as “30 Rock” to “House”, but has only tried his hand at feature films a few times in his life. Not surprisingly then, this particular feature feels an awful lot like an episode of television – an episode of “Law & Order” to be specific, a franchise that Campanella has actually directed before. Ricardo Darin plays Benjamin Esposito, a retired police officer who has decided to write a novel about one of his most famous unsolved mysteries. Naturally, digging up the past brings a lot of unresolved feelings back to the surface of his life, as well as those whose past he is digging up alongside his own. It’s a great story, and I can see why it would have haunted him all these years, but it isn’t anything you couldn’t catch on any of the countless cop shows out there already. I understand that just because a picture picks up an Oscar does not make it a great film but I still can’t help a certain level of expectation. 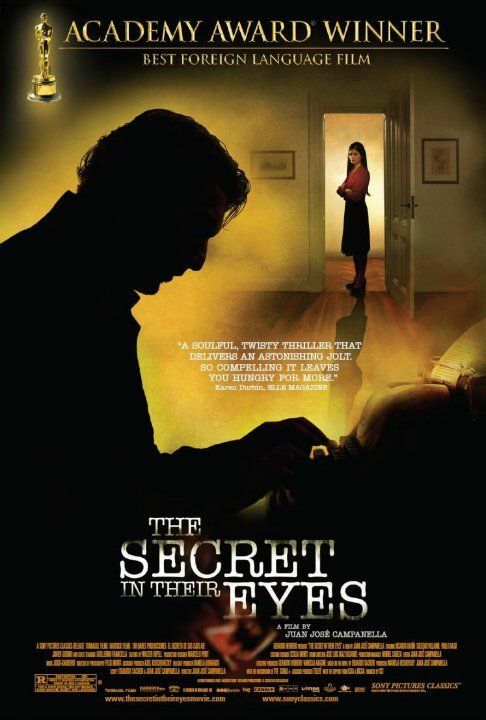 THE SECRET IN THEIR EYES is a very straightforward detective drama with promises that there are further levels just lying beyond our field of vision. When I looked into its eyes though, I didn’t see anything more waiting underneath. Well, this review stinks. You even didn´t do you homework. This guy have been making features since 1991. It´s on IMDB, lazy guy. I don’t mind people saying my reviews stink. I don’t particularly enjoy being called lazy though. I enjoy it even less when I did, in fact, go through Campanella’s IMDB page to see just how many movies he has made in the past. He’s made six features and directed over 50 episodes of television. I’d say my comparison was fair. Oh, and his first feature was directed in 1984, not 1991 .. according to the IMDB anyway. Wow dude… I finally saw this a few days back and really fell for it. I was rather surprised to come here and see that you’d given it just higher than a “meh” reaction. Suggestion – which of course you are under no obligation to follow. Give a listen to the Q & A podcast where the director/screenwriter talks about the story. He details a lot of touches added along the way that you might find interesting…might even boost your impression of the film! Regardless, great post as always – Oh, and also if you’re interested – here’s what I thought of the film.